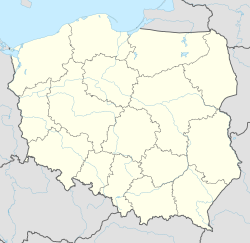 Jasło [ˈjaswɔ] ( listen) (German: Jassel) is a county town in south-eastern Poland with 36,641 inhabitants, as of 31 December 2012. It is situated in the Subcarpathian Voivodeship (since 1999), and it was previously part of Krosno Voivodeship (1975–1998). It is located in Lesser Poland, in the heartland of the Doły (Pits), and its average altitude is 320 metres above sea level, although there are some hills located within the confines of the city. The Patron Saint of the city is Saint Anthony of Padua. In the early days of Polish statehood, Jasło was part of the Castellany of Biecz, out of which Biecz County emerged in the 14th century. A list of rectories, created for collecting tithes, a church in "Jassel" in Zrecin deanery, Kraków diocese, is shown in 1328. The area of the future town belonged to a Cisterian Abbey from Koprzywnica, and by the mid 13th century, Jasło, known then as Jasiel or Jasiol, had a fair of local importance. Together with a number of other locations in Lesser Poland, the village was granted Magdeburg rights by King Casimir III the Great, on April 23, 1366. In 1368 the king made a transaction with the Cisterian monks - in exchange for the town of Frysztak, and the villages of Glinik and Kobyle, Jasło became a royal town. It already had a parish church, founded before 1325 by King Władysław I the Elbow-high. The parish had a school, and in the mid-14th century, Carmelite brothers came to the town. According to Dlugosz in Liber beneficiorum Dioecesis cracoviensis, the church that stands today was built by brothers Stanislaw Cielatko (Czelanthco), Sandomierz scholastic, and Mikolaj of Ciolek arms, in 1446. This occurred because the original was destroyed by the Hungarians. The coats of arms of Strzemie, Traby, Gryf, Janina, and Pobog are on the vault of the church, and because of this, the Slownik Geograficzny suggests these may be noble houses that contributed to the development. Polish Golden Age was the period of prosperity for both Lesser Poland and Jasło, which belonged to Kraków Voivodeship. The city was challenged at the start of the period; in 1474, the King of Hungary, Matthias I Corvinus, burned Jasło in his assault of the foothills of the Carpathians. After this, the town grew, but it never became an important urban location of this part of the country. It had a number of artisans, several fairs and markets. Local merchants traded with both Polish and foreign merchants, mostly from the Kingdom of Hungary, taking advantage of the vicinity of the border. In 1474, the King of Hungary, Matthias I Corvinus, burned Jasło in his assault of the foothills of the Carpathians. In 1550, Joachim Lubomirski, a courtier of Zygmunt August, and his lineage, was given Jasło, after it was converted to a starostwo. When referring the details of a 1564 city inspection, the Slownik Geograficzny described: “Judging by the number of bakers and cobblers, one must conclude that the town was significantly larger then than today.” This is about the Jasło of around 1902, with 2,962 inhabitants at that later time. Jasło was given to Mikolaj Strus by Zygmunt III in 1613. He revived the city and strengthen the prohibition against Jews, "because they hinder the townsmen in trade and buy up all the victuals," as described Strus, according to the Slownik Geograficzny. Good times ended in the 1650s. In 1655, the town was captured and destroyed by the Swedes (see the Deluge), in 1657 - by the Transilvanians of George II Rakoczi, and in the first years of the 18th century - again by Swedish troops of King Charles XII of Sweden (see Great Northern War). Additionally, destructive fires occurred in Jasło in 1683, 1755, and 1826, which likely slowed development of the city. The town was destroyed once again by the Russians during the Bar Confederation. Adam Tarlo became the starosta of Jasło in 1733, and Jedrzej Moszczenski was the next starosta to take office. The starosta lived in a castle in Krajowice, since Jasło had no walls or castle; no traditional castle ruins exist in Jaslo. A monastery and church of the Carmelites also existed in Jasło. The Slownik Geograficzny suggests that it was probably founded before 1437. A well, which St. Wojciech supposedly blessed while traveling from Hungary, existed in the church, which drew pilgrims to the town. The monastery was changed to an office for the starosta in 1786, the well cannot be found today. In 1772, after the first partition of Poland (see Partitions of Poland), Jasło was annexed by the Austrian Empire, as part of Galicia. In 1790, the town became the seat of a district, which had been moved here from Dukla. Several Austrian-German civil servants came here, and office buildings, with a new town hall, courthouse, prison and schools were built. Several houses in the market square burned in the 1826 fire, which resulted in construction boom, and in early 1846, farmers from villages around Jasło took part in the Galician peasant revolt. On June 12, 1846, the Galician riots bred a wave of anti-Jewish riots, which swept through the city, injuring and destroying the property of many of the native Jews. Very close to Jasło, the spirit refinery of Jacob Frant was burnt down. Fire-fighting utilities were ordered not to extinguish the fires by the district captain that arrived at the scene, and other authorities did not intervene. The city and surrounding villages were reported to contain six thousand inhabitants at this time, and a quarter of that population was Jewish, according to the special correspondent of The Jewish World newspaper at the time. One of the clerics that mobilized the peasantry in the following 1848 anti-Austrian rising was Father Karol Szlegal from near Jasło. Between 1840 and 1849, the city maintained a population of about 1950 individuals, according to census data included in the Dictionary of Geography. In 1858, Ignacy Łukasiewicz, a world-renowned inventor, moved to Jasło. Due to his pioneering work, an oil well was constructed in Niegłowice near Jasło (1889-1890). Near Jasło and the nearby Krosno, other crude-oil refineries were established in the mid-late 1800s. At approximately same time, a rail line from Stróże to Zagórz was constructed (1872-1884), with additional connection from Jasło to Rzeszów opened in 1890. "The Parish of Christ's Crucifixion,” which resides at the cemetery, was established in 1862. In 1860, the Austrian Imperial administration again declared the right for Jews to live inside the confines of Jasło. Afterwards, the Jewish population rapidly increased, ingraining itself in the financial and commercial sectors of the city and nearby areas. In the early 20th century, the population of Jasło was 10,000. The town was well-kept and clean, a power plant was built in 1897, then a municipal park was opened, and in September 1900, Jasło was visited by Emperor Franz Joseph of Austria. Between 1880 and 1902, agriculture and cloth manufacturing were the common main occupations in the area around the city. Around 1910, the priest Kisevsky and his six gendarmes persecuted Eastern Orthodox peasants by fining them on trivial pretexts, and many were taken to the court in Jasło to receive their sentences. A Jewish lawyer represented the Orthodox peasants, and described that the Jews in the area were not persecuted for handling lit candles openly, for which the Orthodox peasants were fined. The Ukrainian national group known as the Prosvita (Enlightenment) Society developed affiliates in Jasło between 1893 and 1903. By 1914, the Society spread to 22 Lemko villages, and promoted Ukrainian national ideology, identity, and language. Several World War I battles took place in the area of Jasło, but the town itself was not destroyed. The city was taken behind the Russian front. Railroads ran from Sanok to Jasło and from Jasło to Przemysl, which the occupying Russian forces relied on for transportation of food, munitions, and troops through the front. In May 1915, in the Gorlice–Tarnów Offensive, Russian forces were pushed back by the Germans, who entered Jasło on May 6, 1915, at 22:30. Prussian commander August von Mackensen moved his headquarters to Jasło the following morning, after the line was pushed back several miles beyond the city. In the Second Polish Republic, Jasło was the seat of a county in Kraków Voivodeship. For most part of the interbellum period, unemployment and poverty were prevalent, and the situation began slowly to improve in the late 1930s, after creation of the Central Industrial Region. In 1937, Gamrat chemical plant was opened, but all efforts were destroyed in the Invasion of Poland, September 1939. Jasło belonged to the General Government, and was an important center of the Polish resistance movement. In the night of August 5/6, 1943, the Kedyw carried out a successful attack on the local prison. In September and October 1944, after the Soviet - German frontline was established, and remained unchanged for several months, the Germans began expulsion of all inhabitants of Jasło, as the town was located on the front line. In the late autumn of 1944, Wehrmacht units burned whole town, and as a result, 97% of Jasło was destroyed. In January 1945, only 365 people dwelled among the ruins of the town. The name derives from Old Polish common word for the "manger" or "trough [trof]" which sounded "jasło" < *jesło (before the Lechitic umlaut). Plausibly, it comes from the Slavonic verb "to eat" - "jeść" < *jesti. The Modern Polish equivalent is "żłób" or more seldom "koryto" and the word "jasło" is forgotten in this meaning. The Germanized version was Jassel or Jessel which appeared in 1325. Jasło is an important railroad junction of southeastern Poland, with trains going into three directions - eastwards (to Zagorz), westwards (to Stróże) and northeast, to Rzeszów. Another line, along the Wisłoka to Dębica, was planned in the interebellum period. Construction on it began in 1938, but it was never completed because of World War II. →Jasło is home to a sports club Czarni Jasło, founded in 1910. Jasło has a population that includes Roman Catholics, Greek Catholics, non-Catholics (mostly Protestants), and a small Jewish population. However, it is mainly Roman Catholic, and contains 9 Catholic Churches. "Central Statistical Office(GUS) - TERYT(National Register of Territorial Land Apportionment Journal)". (in Polish) © 2008 Urząd Miasta w Jaśle. Retrieved 2008-10-23. ^ Stauter-Halsted, Keely. The Nation in the Village : The Genesis of Peasant National Identity in Austrian Poland, 1848-1914. Ithaca: Cornell University Press, 2004. ^ Johnston, Alexander (1853). Dictionary of Geography, Descriptive, Physical, Statistical, and Historical, Forming a Complete General Gazetteer of the World. London: Longman, Brown, Green, and Longmans. p. 681. ^ R., Magocsi, Paul (2015). With their backs to the mountains : a history of Carpathian Rus' and Carpatho-Rusyns. Budapest: Central European University Press. p. 133. ISBN 9789633861073. OCLC 929239528. ^ Various. New York Times Current History; The European War, Vol 2, No. 3, June, 1915 April–September, 1915. 2005. From section: "Seven Days of War East and West"
^ Prit,, Buttar,. Germany ascendant : the Eastern Front 1915. Oxford. p. 204. ISBN 9781472819376. OCLC 993315423. ^ a b c d e f g h "Jasło Official Website - "Współpraca Międzynarodowa Jasła" (Jasło's Twin Towns)". (in Polish) © 2008 Urząd Miasta w Jaśle. Archived from the original on 2008-03-17. Retrieved 2009-10-22. Wikimedia Commons has media related to Jasło.